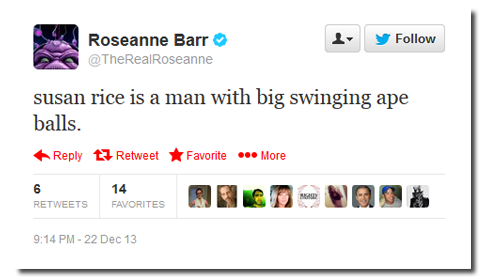 It seems that Roseanne Barr is clinging to her embrace of racist populism and conspiracy theories. Though Jarrett's name is not mentioned in the piece, Roseanne's response is perhaps not surprising, as the comedic sensation often moonlights as a Twitter troll. Jarrett, who is African-American and has no connection to the religious and political Muslim group known as the Muslim Brotherhood, has long been a target for right-wing critics and conspiracy theorists. During Obama's tenure, suspicions spread on right-wing blogs that Jarrett allegedly expressed a desire "to help change America to be a more Islamic country." The fact-checking website Snopes ruled that claim to be false. Last March, the British tabloid "The Daily Mail" published a report that Jarrett had moved in with the Obamas to help "mastermind" the former president's "insurgency" against sitting President Donald Trump. Though the Mail's report cited anonymous sources that could not be verified, the story circulated in several news outlets including the Daily Caller, Fox News, Hollywood Life and Newsmax, who, in turn, cited only the tabloid. Right-wing conspiracy theory websites like InfoWars alleged that Obama is leading an "army" of anti-Trump activists, whom the site referred to as a "shadow government," from his home located two miles away from the White House in the Kalorama neighborhood of Washington, D.C.
Tuesday's tweet is not the first time Roseanne has used racially-charged language to describe an African-American woman from the Obama administration. In a since-deleted tweet from 2013, Barr tweeted, "susan rice is a man with big swinging ape balls." The comic is currently starring in a successful revival of her legendary sitcom "Roseanne" on ABC. After public outcry on Tuesday, she apologized and announced she would quit Twitter. Although she has come under scrutiny for her aggressive and racist online presence, CNN's Brian Stelter wrote on Tuesday: "My reporting form March holds true today: ABC execs hold their noses when Roseanne tweets. They know it's problematic. They want her to focus on the show. But they say there's no controlling Roseanne..."